I disliked the simplistic language used in this book and that the beginning of the book was meant to appeal to our greedy side "You can have money!" I'm all for positive thinking because it does affect how we experience life, but I do not believe that we can sit back and think our dream car to ourselves nor that we accidentally bring negative things to ourselves by unknowingly thinking of them too much. Sometimes things just happen. Sometimes we need to work for what we want. I think we're here to learn lessons and the Universe deals us cards that we don't want for that purpose.It doesn't spoil us by giving us what we want, but challenges us with struggles to make us better people in the long run. i do not regret hearing the secret. you have so much to learn from this book. Even Oprah talked about this book on her show. 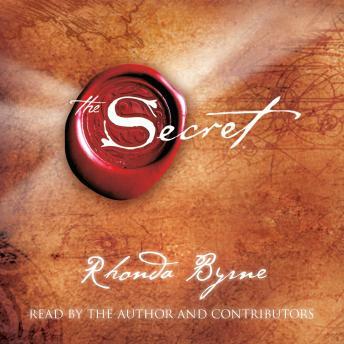 I highly recommend the secret to everyone, especially pessimistic people who need help. I do get the positive thought process of this audio book however the reader lost me half way through due to the ridiculous examples she used and the manner in which it was delivered. the book has very little credibility as far as I'm concerned. making reference to famous successful people "who knew the secret" was blatant bull. Dont waste you time. While its important to keep positive attitudes, maintain a clear goal, and eliminate negative thoughts from interfering with your life, I feel that this book oversimplifies this and its airy presentation glosses over some of the hard truths of life. Couldn't do it after 10 minutes - packed it back up and sent it back. Couldn't understand the reader - may have been a great book, but the reader killed it! This book was more commentary of the secret. But the actual secret is spelled out for you. Along with an action plan to achieve it. Very "new age". Basic, sometimes too basic; "positive outlook, gets positive results" book. I could pass on this one. Place Maxwell Maltz's "Psycho-Cybernetics", Norman Vincent Peale's "The Power of Positive Thinking", and Richard Bach's Jonathan Livingston Seagull into a black caldron. Boil, stir, and add a pinch of Haight/Ashbury flower-child poetry from the 1960's just to spice up the brew a bit. What do you get? A potent mix for a new cult of "The Secret" followers. If it sounds too good to be true, rememer, it always is. And just like The Force in Starwars, there's a very dark side to "The Secret": any victim of random violence, accidents and/or natural disaters brought it on themselves by "thinking wrong thoughts." What a bunch of blame-the-victim dribble. Some secret. This book is truely a waste of time. I can't believe that there are people out there who actually listen to this crap! After 30 minutes of listening I put in the last cd and listened to the last 5 minutes. There was no change, it was just as dull in the end. I wasted a rental getting this book and then didn't even listen to the whole thing, I couldn't. Save yourself! Don't rent this book! It is not worth the 3 stars the average gives it.